RT: You had co-authored a paper on “Towards a Historically Informed Asian Model of Communication”. Can you elaborate more about the Asian Model? GH: What I meant about the Asian model is that the key relationships in Asian societies are different from Western societies. Because of this difference, the challenges to operate in these societies and ways of managing the challenges to manage relationships are different. The job of problem-solving that Public Relations does in Asian societies is going to be of a specific Asian nature. Those relationships are always ones in which the state or the nation or the government plays a larger role than they typically would in the West. Looking at what this means for PR – PR is historically driven by the needs of the state and governments to interact with its people and today, there is the need for organisations to include this in its key relationship management. And all of these are unique. RT: Taking a reality check, tell us how easy or difficult it is ‘Starting up Reputations in Emerging Asian Markets’, a topic that you have focused on in your writing? GH: I don’t think that it is inherently harder or easier than in non-Asian countries. It seems hard when you approach it with models that are not appropriate. For me, this calls for an in-depth Asian understanding of PR and Reputation Management. RT: Your research interest areas are: Globalisation and Corporate Communication. Any personal points of view on this? GH: One of the main challenges of PR today is actually a bit of a contradiction; Because, on the one hand, we are trying to find out what are common standards and common capabilities that unite our profession. But, at the same time, we need to recognise and discover that there are very genuine differences in the way PR is being practiced culture to culture. That’s what makes the connection between PR and globalisation so fascinating, because there’s a counter dynamic here. There is an inherent need for our profession to have joint global standards and to discover who we are. RT: You wear many hats – that of an educator, a biz-school grower and a communication researcher. Which is the role that you enjoy the most? GH: That’s a very hard question. I’m not sure if there is a role that I enjoy a lot, but what I do enjoy a lot is listening to people, and learning what challenges other people have and how they solve them. Sometimes I do that by listening to managers, communications people or scholars across the world and I enjoy that tremendously. RT: You were originally Co-founder and Co-CEO of Publicis Public Relations (today MSL). How was the journey for you, after you crossed over to academics? GH: The opportunity to think about some of the long-term challenges of our profession without necessarily at the same time, thinking about revenue – that is very helpful. Because it gives me the freedom to think about ‘wicked’ problems of our business! At the same time, what I enjoy immensely is being embedded in our business, because if academia does not solve problems, it is not doing good research! 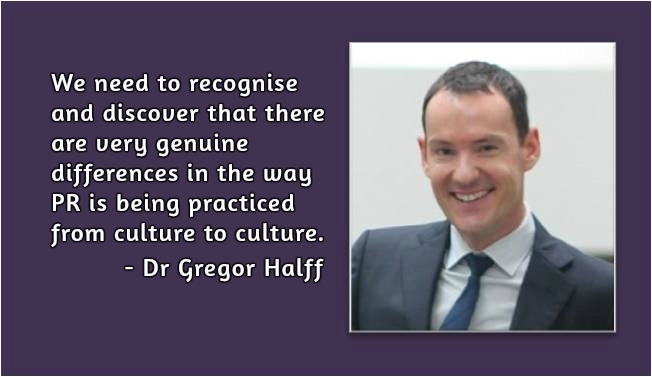 Be the first to comment on "In Conversation – Gregor Halff"